Thirty years ago, howling winds among the blackened ruins of Los Angeles in the year 2029 AD and a flying machine of death and destruction began James Cameron’s 1984 classic science fiction action thriller The Terminator. This film was a landmark for the director as well as its star Arnold Schwarzenegger and began one of cinema’s best known sci-fi franchises. It has many great qualities that many films have since tried to emulate. Such as its pulse pounding pacing and action, as well as the many interesting themes it explores (i.e. : the conflict between man and machine and the idea of fate and whether it can be altered). The story involving a ruthless killer cyborg played by Schwarzenegger coming from the future to kill a waitress called Sarah Connor (played very well by Linda Hamilton), the mother of the future human resistance leader John Connor, examines the idea of humanity losing control of the technology it created. All of this is done through the lens of classic ’80s high-powered action and gun battles. One of the memorable things about The Terminator is how uncompromising it is. 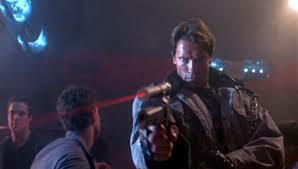 The brutal nature of the terminator is on full display as he coldly executes his targets and relentlessly pursues Sarah. This is also explained quite well by her protector Kyle Reese (another excellent performance by Michael Bien), a soldier sent back from the future to protect her. He tells her quite bluntly that the machine will not ever stop until she is dead. Any discussion of The Terminator would not be complete without mentioning the fantastic future war sequences that start the film and are seen in flashbacks throughout. It showed a scary post-apocalyptic landscape of a city destroyed by nuclear fire, and massive hunter-killer machines trying to wipe out any humans that appear as if they were rats. This is all seen through the eyes of Kyle Reese, and when he is shown getting back to a human hideout, the sense of misery and despair among the surviving humans only heightens the tension. It makes his mission to protect Sarah and ensure that humankind has a fighting chance all the more important and desperate. 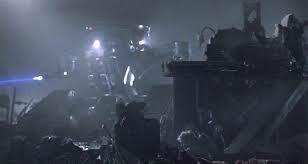 It also demonstrates the terrifying nature of terminators as one infiltrates the hideout and mercilessly slaughters anyone nearby. This is paralleled by the present-day terminator walking into a police station and killing everyone he sees in an effort to get at Sarah. Speaking of Sarah, the film well presented the theme of a once-timid character who finds her inner resolve and becomes a completely changed person. By the end of the film, Sarah Connor is just as determined and full of fight as the machine that is stalking her. All of these qualities are why the movie is still admired and seen 30 years after its release. 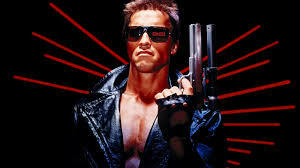 The Terminator stands out among many of its decade’s other action films. It propelled James Cameron and the cast to stardom and led to him directing other favorites like Aliens, The Abyss, Titanic and Avatar. It cemented Schwarzenegger as an international star and created a fascinating universe that was further developed in three sequels, books, comic books and a TV show that expanded on the world of the super computer Skynet bent on humanity’s destruction. This world will be revisited in next year’s Terminator: Genisys. Hopefully, it will be as action packed and exciting as the classic 1984 original that is still the best of the series and will endure for years to come as a sci-fi masterpiece.